The N.Y. Times has published a mammoth story, based on confidential Fred Trump documents and tax returns, into how Donald Trump built his fortune. Why it matters: The documents suggest Fred Trump provided his son with as much as $60.7 million in loans ($140 million if adjusted for inflation), in contrast to Trump's suggestion he only received $1 million. "All told, The Times documented 295 distinct streams of revenue Fred Trump created over five decades to channel wealth to his son." "When Fred Trump died in June 1999 at the age of 93, the vast bulk of his empire was nowhere to be found in his estate — testament to the success of the tax strategies devised by the Trumps in the early 1990s." The IRS reportedly provided little pushback against the Trumps' tactics. Trump reportedly tried to change his father's will when he was sick to benefit himself. Fred Trump illegally purchased $3.5 million in casino chips at his son's casino in 1990, ultimately paying a $65,000 fine. 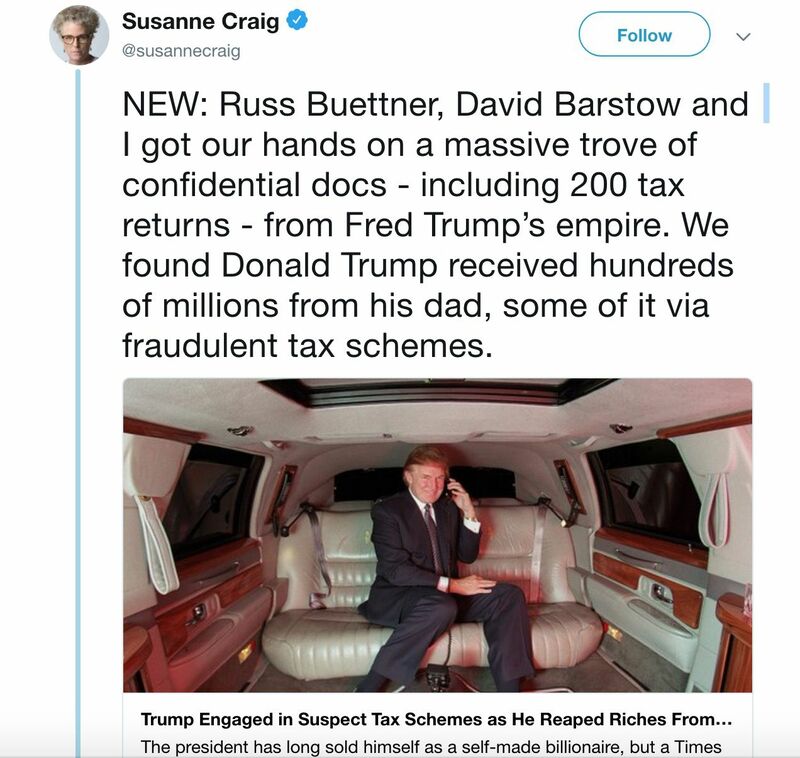 The bottom line: Fred Trump's documents reveal he acted like the stereotype of a rich person, using every possible legal tax loophole (along with some that were less than legal) to pass his fortune to his children. What's next: "The Tax Department is reviewing the allegations in the NYT article and is vigorously pursuing all appropriate avenues of investigation," a spokesman from New York State Department of Taxation and Finance told CNBC. Hillary Clinton speaks at The Atlantic Festival today in D.C. The FDA seized thousands of pages of documents from Juul's San Fransisco headquarters, the agency said today. Amazon is increasing its minimum wage to $15 an hour for part-time, full-time, temporary and seasonal workers in the U.S. starting November 1. Go deeper. Chinese streaming company Tencent Music has filed to go public in the United States. Go deeper. How online propaganda weaponized social media: "Russia is not the full story," Peter Singer tells Axios. "Russia is just a chapter in a larger book." Go deeper. Tesla met its Q3 production targets on Model 3 sedans: The company produced 53,239 Model 3 sedans in the third quarter and delivered 55,840. P.S. Here's a timeline of the Kavanaugh allegations, as they've unfolded this year. Time's Up, the movement advocating for safer work spaces for women in the entertainment industry, has hired WNBA President Lisa Borders as its first CEO, Vanity Fair reports. “I was being not just invited, but encouraged—implored—to step forward and be part of this transformational change for women,” Borders told the publication.